Land Investment Only Works with Motivation. Jack and Jill discuss today. Jack Butala: Land Investment Only Works with Motivation. Leave us your feedback for this podcast on iTunes and get the free ebook at landacademy.com, you don’t even have to read it. Thanks for listening. Jack Butala: Welcome to our show today. 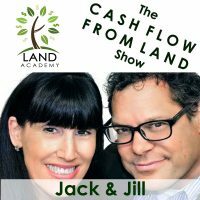 As always, in this episode, Jill and I talk about land investment only works with motivation. Wait, we wrapped up yesterday’s show with that sentence, I think. Jack Butala: Land investment only works with motivation. Before we get into it, let’s take a question posted by one of our members on the LandAcademy.com online community. It’s free. Jill DeWit: You go ahead. Jack Butala: Or I can answer if you want. Jill DeWit: Go ahead, Jack. Jack Butala: No, you go ahead. Jill DeWit: No, you go ahead. If it’s above $4,000, here’s what we do. We do it through escrow and you need to be real upfront about with the escrow agent. There’s all these tiny little boutique escrow companies popping up everywhere and the more boutique they are and the more new they are, the more willing they are to do creative stuff for you. You’re not going to find that regular first American title agent who’s going to do a lot of independent servicing and it’s not their fault. They just have regulations that come down from corporate and that’s how they have to do it. You want to explain to the escrow agent that this is a dual closing and it’d be great if we don’t discuss the economics of the thing with every single party. Jack Butala: But I don’t think that it should necessarily close the deal. If the person, the buyer is interested in the property, they like it, they like the price, they like the terms, I think it’s okay to disclose the whole thing. Jill DeWit: You know it’s funny? Jill DeWit: You use the term that I have. I have equitable title. That’s an easy thing of you just say that too, “I have equitable title in the property,” and lay it at that. I was going to add which is kind of funny, I’ve never had a person who questioned my ownership and how do I say this? I’ve had people that have questioned my ownership and they’ve even asked me to send me a copy of the recorded deeds to prove it. Those guys are never, they never follow through. Jack Butala: They don’t buy anything. Jill DeWit: Don’t even bother. They don’t buy it. They’re not real. They’re liars. Jack Butala: … instead of looking for a way to get the deal done. Jill DeWit: Exactly. Yeah. If anyone says to you, “Well, I need to see proof of that. Can you send me a copy of the recorded deed?” We’re out. We’re passing because you’re not going to really buy it anyway. I can tell you from experience, they never follow through. Jill DeWit: I was going to add, in my situation, I really did own that property. I really did have the title of recorded done, ready to go and it’s … The whole point was it was just, they weren’t the right people. I have tested it. I sent them. “Here’s the recorded deed. See that? That’s my name on there. Now, let’s talk about it.” They’re like, “Now, I need to do this. Now, I need to know that.” Yup because you weren’t real. You weren’t really serious, so got it. Jill DeWit: Dude, you can’t say that. Jill DeWit: They all have gray hair on their ears? Jack Butala: They’re older. They’re usually older people that think they had it all figured out. Jack Butala: Okay. Blue. I don’t know. You know what I mean. Jill DeWit: You just end … There they went. That’s what I heard of. The radio went off. Just kidding. Radio. Jack Butala: Yeah. They’re the same people who don’t know what a podcast is. Jill DeWit: Okay, so they’re not listening. Okay. Oh. Now, I know where you’re going with that. Jill DeWit: Yeah. Let’s move on. Jack Butala: … on LandAcademy.com. That’s how I get out of these things with you. Jack Butala: I just say the transition, over top. 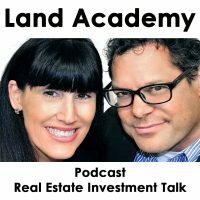 Jack Butala: Today’s topic: land investment only works with motivation. Man, is that true. This is the meat of the show. Jill DeWit: Where do I start? Jack Butala: This is Jill’s gig. Jill DeWit: Okay. That’s my one point. My second point is, time and patient are key. No one’s going to be a pro instantly, so you got to … To help you stay motivated, you got to expect that. You have to expect you’re going to screw things up, you’re going to send mailers wrong, you’re going to price things wrong, you’re going to talk to people wrong. There’s a lot of things you’re going to do, deeds wrong. You got to be ready for it. It’s okay. We all did that. Shocks. I’ve had things recorded, return from their courier saying, “You forgot to enclose the check.” “Oh yeah, because I did.” Little things like that and it’s okay. Jill DeWit: … what you’re doing, all day, everyday. Mine’s not so specific but I have goals for the week. Where do you want to jump in? Jack Butala: I just … You get all misty and stuff because that’s why Jill and I are doing this. We don’t need to do this. Jack Butala: That’s why we do this. Whatever motivation that … Look, my point is this, that guy was motivated. Jill DeWit: That motivated you? Jack Butala: Well, it motivated me, sure. Jack Butala: That’s why we do this. Jack Butala: That’s why we fight. Jack Butala: I don’t know what kept this guy motivated but I think I’m going to tell you another story because we have time. Jack Butala: You’re going to love this, Jill. Jill and I are in Costco recently. Two people walked up and said, “Are you guys the Land people? Aren’t you guys the Land people?” The husband did. Jill DeWit: That was so cool. Jack Butala: … we’re the most regular people that ever are. Jill DeWit: Thank god we were presentable that day. Jack Butala: I said, “I got to ask you what …” Because I’m always wondering how people find us and why, why they stick around and listen. These aren’t members by the way, they’re just people that … I’m not sure exactly how far they’re in. I got the feeling they’re new. I said, “What’s the deal? Why?” He said, “I got to do something.” That just stuck with me. Jack Butala: I love that. Jack Butala: Maybe it was kids, maybe it was too much responsibility at work, maybe it’s an idiot boss, who knows? Jack Butala: All kinds of stuff motivates you. Whoever you are listening to this, there’s motivation right in front of you. Jack Butala: You just have to look at it right. I think that’s how you look at it, Jill. That’s how you find inspiration and motivation like … I think it’s person specific, don’t you? Jack Butala: For Land Academy. Yeah. Jill DeWit: Right. Motivating me. Jack Butala: For me, it’s for Land Academy. Jill DeWit: Now, it’s what’s pushing forward all this other stuff because I can help all these people do this. Hey, now I know I can help those people do that and now I know I can help these people over here. Oh, and I can write a book that’s going to help these people over here and we’re starting some meet ups. Hey, we’re going to help some other people with some little things around here in the South Bay and in Scottsdale and all kinds of good stuff. Yeah. You heard it here, by the way. If you want to come meet Jack and I, I’m hoping to wrap it up here very soon. By the time this airs in a few hours, it maybe ready, so go to meetups. If you look for land investors, you will find us. Jack Butala: You know what motivates me to buy and sell property, though, which is really what’s all this is all about? Land Academy was just unintended consequence. I am literally and I mean literally, addicted to buying real estate. Jack Butala: Some people are addicted to all kinds of stuff you can get addicted to. Jill DeWit: You land junkie, you. Jill DeWit: You know what? I’m a land junkie. That’s good. Jill DeWit: Yeah. I get it. That’s really funny. You’re right. 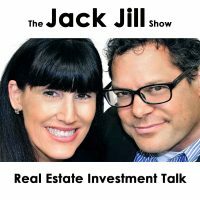 Jack Butala: You are not alone in your real estate ambition. Motivation is so important. Jill DeWit: It is. You could have all the resources, all the money, all the time in the world but if you’re not motivated to get up and do this, that doesn’t matter. Jack Butala: I wonder how you teach discipline. We should take the marine course or something, use it as an example. There’s some former military guys that we have in our group that just won’t stop for anything and we’re impressed by that. Jill DeWit: Yeah. That’s very true. Jack Butala: What motivates you, seriously? The feedback? Jack Butala: Because what I heard you say on the show is the feedback. Jack Butala: What motivates you to show up for this show in time, let’s say. Is it the feedback? Jill DeWit: No, I’m afraid of you. Jack Butala: Oh, my gosh. What if there’s a … There’s no child social services for wives. Jill DeWit: Spousal social services. No. Jill DeWit: He’s mad at me again. Jill DeWit: Just kidding. No. Okay. You want to know what motivates me? Jack Butala: Yeah. I’m afraid now. Jill DeWit: No, it’s … Sorry, it’s not you. It’s bigger than you. All right. I’ll tell you mine and you tell me yours, please? Jack Butala: Show me yours. Jack Butala: Don’t touch it, just show it. Jack Butala: Don’t touch on it. Jill DeWit: Stop that. No. When people get … I’ve had people tear up with me in situations. I’ve had these handwritten notes and beautiful emails and I sit there and I tear up. That’s motivating to me. It’s like, “Holy cow.” Obviously doing the right thing. Don’t stop. That’s number one. Number two, I simply love our lifestyle. Jill DeWit: One of those we plopped, “I’m going to New York next week and meeting with some people.” I love … All these things motivate me so. I know our kids are proud of us. I know that. They don’t say it. I know, they don’t say it but they’re proud of us and that motivates me. You? Jack Butala: Now that I’m thinking about it. Jill DeWit: Show me yours. Jack Butala: This is a sentence I said to myself in my head, “I would rather flip burgers for the rest of my life than be a partner here for one more year.” This is a very well-paying job with some incredible people at that level and I just … I’m very, very motivated by not having to go into a job everyday. I’m not saying that that’s everybody’s motivation. Jack Butala: I’m just saying, for some reason, that I don’t know why. Jill DeWit: That was yours. Jack Butala: Our time is our … We have choices. Jack Butala: Our time is our own. Jill DeWit: That’s how you knew you were doing the right thing. Jack Butala: My real motivation is not to have a boss and to to go into some place in work and have it sucked for 8 or 10 hours every single day. Jill DeWit: Exactly. You know what I think we should do after the show? Jill DeWit: Go to a movie. Go goof off. Jack Butala: That’s what I’m saying is that we do it. How many time do we do it? Probably once a week at least. Jill DeWit: We do that. We’re good at that. Jill DeWit: Well, there is that. Perfect.